Price includes shipping to New Zealand addresses, via Courier Post, OR partial shipping to international addresses (see below for more info). Christchurch and Canterbury are on a transformative journey as the region recovers from significant natural disasters, including earthquakes, wildfires and floods. The cities, towns and even highways are being rebuilt. As each year passes, more significant landmarks reopen after extensive repairs. The Kaikoura Earthquake in 2016 dramatically changed the geographic layout of the South Island and scenic coastal road forever. 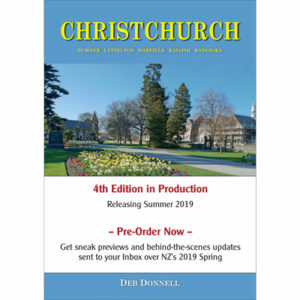 Christchurch 4th Edition book is currently in production, with Deb Donnell taking photos around the region over the 2018/2019 summer. Pre order your copy now, and get sneak previews and behind the scenes updates sent to your inbox over the summer. Join Deb on a full colour tour of Christchurch CBD, New Brighton, residential red zone, the Port Hills, Sumner, Lyttelton, Darfield, Kaiapoi, Rangiora, and Kaikoura. The book will include comparison photographs taken before and after the disasters, and updated from the same locations over the summer of 2018/2019. It is estimated to have 64 pages and over 70% of the images will be new to the series. Pre-order your copy now to add to your Christchurch memorabilia collection, or to gift to loved ones who are following the region’s transformative journey. Shipping Notes: The Pre-Order price includes $10 shipping the physical product via Courier Post to NZ Addresses. For International Orders, shipping to your address via Airmail will be approx. $10-$20 extra, depending on where you are located. We’ll invoice you the difference prior to shipping the book in autumn 2019 (once we know the exact shipping costs).